Two community matrons’ groundbreaking approach to training care home staff is significantly reducing emergency department attendances and saving thousands of pounds. Two community matrons’ groundbreaking approach to training care home staff is significantly reducing emergency department (ED) attendances and saving thousands of pounds. 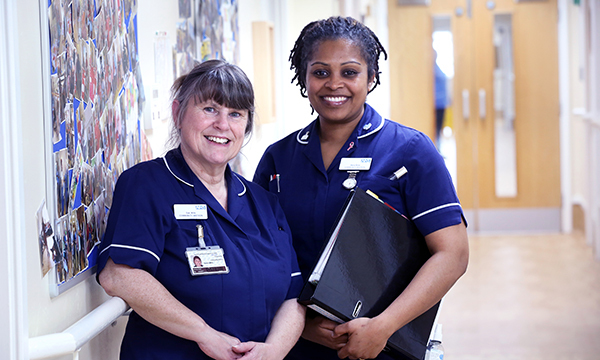 Susan Wills and Dena Ross have reduced unplanned and avoidable admissions by supporting the carers to manage residents safely in their nursing homes. For their ‘fantastic piece of work’, the matrons from Sandwell and West Birmingham Hospitals NHS Trust (SWBH) have been named winner of the BUPA-sponsored Nursing Older People category (see finalist panel) of the RCNi Nurse Awards 2017, the profession’s top accolade. They put into practise first-person-on-the-scene (FPOS) training to upskill staff, and to improve their confidence and competence in dealing with healthcare professionals. Susan says: ‘We had been working tirelessly to establish empathetic, trusting and supportive relationships with care home staff, and with residents and their families during episodes of clinical care. ‘However, the workload from our 34 care homes had become increasingly demanding. This resulted in reactive not proactive interventions, with questionable effectiveness, and our success in reducing unplanned and avoidable events had been limited. The team asked care home staff what they needed to support their residents. The overriding consensus was skills and knowledge on long-term conditions, and awareness of how, who and when to call for additional support. ‘They told us their training is predominantly computer based and basic, and did not empower support of residents in crisis,’ says Susan. Care home staff also reported that they often felt intimidated, criticised and unsupported by health professionals, and pressurised by relatives. The matrons therefore sought to foster collaboration and respect between clinicians and carers. GPs said carers often requested frequent or inappropriate visits unsopported by valid relevant information. The ambulance service thought 999 was used inappropriately as an ‘easy option’. District nurses and other health professionals were critical of the standard of care provided. Dena says: ‘This is no fault of the care homes as each home has different training and skills matrices. The matrons also found that hospital staff had a poor understanding of care homes. ‘Care home staff told us that they feel undervalued and under respected by other health professionals, who gave negative feedback about them,’ says Dena. After researching training opportunities and consulting with West Midlands Ambulance Service (WMAS), the matrons decided its FPOS training programme would benefit the care home carers. Drawing on statistics from WMAS, their own trust’s informatics departments and their own ‘soft intelligence’, Susan and Dena identified the ten care homes with the highest levels of unplanned or avoidable hospital attendances and 999 use, and secured initial funding from their trust for a pilot. Home managers and their company chief executives agreed to the training when they were presented with the evidence of unplanned admissions from their homes. The two-day WMAS course to a nationally recognised BTEC qualification was delivered in five sessions over two months. It was offered to five carers who worked out of hours at each home. ‘Statistics reveal that around 60% of unplanned admissions occur out-of-hours, when staffing levels and support mechanisms are reduced,’ explains Susan. ‘We did the training with senior carers even though nurses and managers were interested in it. We knew it needed to be people delivering the hands-on care,’ says Dena. The feedback was good. Delegates felt much more confident and able to manage residents in a crisis, and to discuss their care needs with other professionals. The ambulance training was notfound to be as relevant, however, so the team worked with WMAS to create a bespoke course for Sandwell care homes. They then secured a further £10,000 from Sandwell and West Birmingham Clinical Commissioning Group to implement the new course, called Hospital avoidance – an integrated approach to long-term care. The team’s results are impressive. It can demonstrate an 18% reduction in ED attendances and a 29% reduction in admissions to SWBH. In January to December 2016 there was a 10% reduction in attendances and a 26% reduction in admissions compared with the same period in 2014. With the cost of an acute bed calculated to be £215, this is a minimum cost saving of £115,000. Bupa professional standards manager Sue Roberts was also on the panel. She says: ‘The winners demonstrated passion and enthusiasm for the people in their care and they have the potential to improve the lives of hundreds of care home residents. ‘Going into hospital can be a daunting for many of us and, given the current climate where acute hospital beds are at a premium, any actions to prevent hospital admissions should be applauded. The team is continuing to evaluate the effectiveness of the training by assessing whether the number of referrals from care homes to community services has increased in line with the carers’ knowledge and skills. Susan and Dena are also evaluating care planning for residents so that they can demonstrate an increase in advance care planning, do not attempt cardiopulmonary resuscitation and preferred priorities of care documentation. ‘WMAS plan to roll out the bespoke course to care homes in other areas of the West Midlands, based on the feedback and perceived success of our initiative and we are looking at creating bespoke training for nurses,’ says Susan. The team hopes that the training will become a rolling programme. Dena says: ‘Our vision has never been just to work as community matrons, it has been to upskill, empower and standardise care and carers. This matron-led dynamic team of 17 band 3 support workers provides enhanced one-to-one care 24 hours a day for the increasing number of confused and high-risk Lister Hospital patients who were being cared for by unskilled agency staff. Safer staffing matron Emily Watts (pictured) devised and implemented the initiative. The team uses distraction and therapeutic techniques to calm and settle patients and keeps them safe. Feedback praises its exceptional, compassionate care and falls have reduced. The trust saved £144,000 in agency spend in three months. Liaison psychiatry team lead Nicola Wood (pictured) was highly commended by the judges for significantly reducing the number of moves experienced by patients with dementia at Forth Valley Royal Hospital. Patient and carer experience has improved and nurses are reducing the risk of delirium and distress. Staff feel empowered to advocate for this patient group. The number of people moved before 8pm has risen from 52% to 92% and those with two or more moves has fallen from 33% to 2%. The number of those moved after midnight has also dramatically reduced. Renal elderly care liaison nurse specialist Carol Bartholomew (pictured) assesses, identifies and addresses the care needs of Hammersmith Hospital patients with chronic kidney disease and those on dialysis aged 70 years and over and those 60-70 years deemed frail. Screening includes frailty, memory loss and mobility. Dialysis unit teams report spending less time on patients’ supportive needs. Patient satisfaction scores have improved and distress scores reduced. The team, including practice development nurse facilitator Maria Loughran (pictured), implemented a dementia companion band 2 one-to-one care role on Antrim Hospital wards. Episodes of 'violence and aggression' have reduced by 75%. Falls have reduced and nutrition and hydration have improved. Patients feel calmer, valued and less isolated. Families are more confident their loved ones are safe. The companions have a calming effect on wards, have released time to care and play an important role in the protection of vulnerable adults.